Heat coals or gas grill for direct heat. 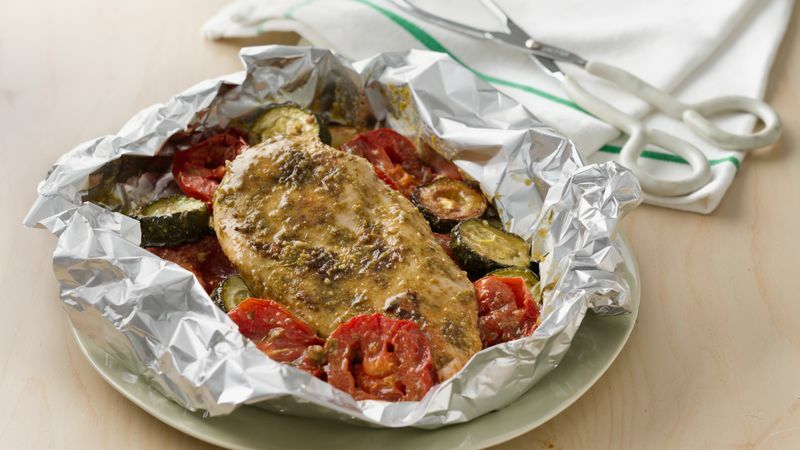 Place 1 chicken breast half, 2 sliced tomatoes and 1 sliced zucchini on one side of four 18x12-inch sheets of heavy-duty aluminum foil. Spoon 2 tablespoons pesto over chicken mixture on each sheet. Fold foil over chicken and vegetables so edges meet. Seal edges, making tight 1/2-inch fold; fold again. Allow space on sides for circulation and expansion. Cover and grill packets 4 to 5 inches from medium heat 20 to 25 minutes or until juice of chicken is no longer pink when centers of thickest pieces are cut. Place packets on plates. Cut large X across top of packet; fold back foil. Instead of using foil packets, try the new heavy-duty foil bags made especially for grilling. Pesto is a sauce made of fresh basil, garlic, oil, pine nuts and grated cheese. A variety of pesto flavors is now available, and you may want to experiment with one of them in this recipe.